Something strange happens in Germany on Easter Sunday. Excited children run around, pushing the furniture in their apartments, lifting the cushions and looking under trees and bushes in their garden. Why? They try to find Easter Eggs that have been hidden the night before by the Easter Bunny! The children are searching for their small basket or nest, inside are real colored eggs or chocolate eggs, and a chocolate bunny. 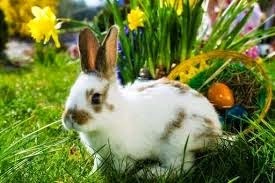 The Easter bunny is a symbol for fertility and resurgent life. 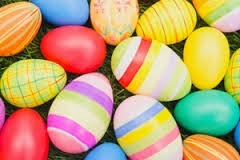 Colorful and decorated eggs are a symbol of resurgent life in the spring. 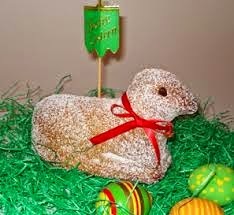 They are on every table at Easter, whether made of chocolate or colored. Blown or hard-boiled eggs can simply be painted and decorated, depending on the age, according to taste of the children (and adults). The eggs can also be dyed with store-bought dyes or by boiling the eggs with natural substances such as onion skin or beetroot juice. Vinegar added to the water makes the colors brighter and rubbing with either bacon fat or salad oil produces a shine. 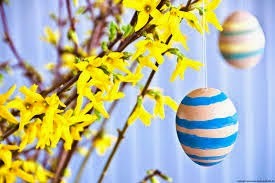 You can find a lot of Easter decorations in many German homes. Decorated blown eggs are sometimes hung on yellow forsythia branches in a vase together with little wooden painted eggs, Easter bunnies or chicks. The lent of forty days is less strict than in further times, but many people try to live without chocolate or alcohol or other nice habitudes. In Germany the Good Friday is a holiday. In some towns the traditional Good Friday Procession can be seen. You don't hear the church bells and no loud music. In some regions, there are special traditions, for example the Easter bonfire or the blessing of the Easter basket filled with the paschal lamb and eggs. On Easter Sunday and Monday (holiday too) the families are spending time together. Some are going to church, they are baking an Easter wreath or a paschal lamb made of yeast dough, eating a good meal, often lamb, searching for the Easter Eggs and going for a walk to welcome the spring time. Johann Wolfgang von Goethe even wrote a poem named « Osterspaziergang » about this joyful walk.